This course package is designed for individuals looking to become a personal trainer and hit the road running! Whether you are looking to work in gyms such as The Gym, Pure Gym or David Lloyds or even start up your own exciting fitness business this course is for you! 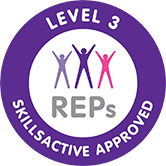 REPs and CIMSPA endorsed, the courses in this package are the basic principles of becoming a personal trainer and are the industry standard qualifications that every fitness employer is looking for on a CV. You will start with the Level 2 Certificate in Fitness Instructing and cover subjects such as anatomy and physiology, principles of exercise, fitness and health and how to design and instruct gym based exercises. Once you have passed the Level 2 part of the course you will gain certification as Fitness Instructor and gain employment in the fitness industry while working towards your Level 3.